Fatigue is a dangerous problem in every industry—and it’s an increasingly common condition. When fatigued, people make more mistakes, they become distracted and unmotivated. Tired workers are also more likely to become ill. And when it comes to productivity, employees can cost their company almost $2,000 per worker each year in fatigue-related productivity losses. But, most importantly, workers suffering from fatigue are more likely to cause a serious accident due to slow reaction times, forgetfulness or simply missing something vital. Although there are many reasons for fatigue affecting your employees and, by extension, your company, it’s best to start by looking at the biological functions that govern sleep—and perhaps the single most important factor is circadian rhythm. Most people naturally experience changes in sleepiness and alertness throughout the day, with two dips in alertness in a 24-hour day. Usually, the larger dip occurs around 2–6 a.m. and the smaller one around 1–4 p.m. These patterns are controlled by our circadian biological clock, which regulates the timing of periods of alertness and sleepiness throughout the day by responding to light and dark, consequently affecting our physical and mental states. 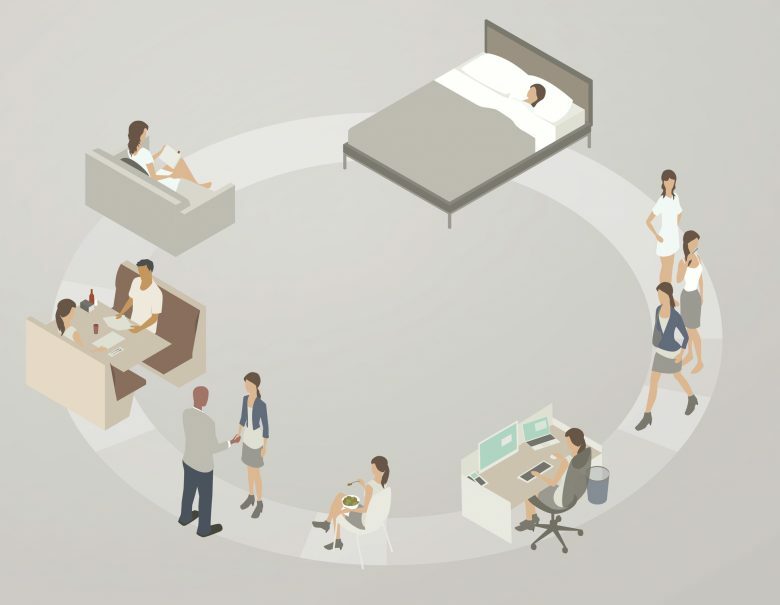 Circadian rhythm can be easily disrupted by many factors, including sleep deprivation, working long or irregular hours, shift work, or even being on-call. Any of these can affect a body’s regeneration cycle and lead to almost constant fatigue. This reduces the clarity of thinking and performance. Continually not getting enough sleep only makes things worse, affecting employees’ health and performance and, in most industries, increasing the risk of injury. Lack of sleep kills productivity and has a negative impact on almost every other performance factor. And that’s because every aspect of human biology is influenced by it: mental capabilities, reaction time, memory, awareness and many other faculties can go down by as much as 50% affecting productivity at home and at work. Sleep deprivation aggravates medical conditions and even makes people more likely to remain overweight or to gain weight. Simply put, employee health can deteriorate because of this easy-to-control factor. But people’s health is not the only victim of their lack of sleep. Safety and is another. Because lack of sleep also causes fatigue, which jeopardizes everyone’s safety. Many leaders don’t believe that fatigue is a serious issue at their workplace or that their company is affected by it. Unfortunately, they have a skewed perception of this problem or are minimizing its impact. Fatigue is becoming so wide-spread that it’s hard to find an industry not affected by this dangerous condition. This is why it’s important to use preventative measures and thorough education to address it. Lack of sufficient, quality sleep causes the sleepiness we experience during the circadian dips to be more intense. And unfortunately, the human biological clock, which is responsible for the post-lunch dip in our energy (and the mid-afternoon peak in traffic accidents), cannot be fooled by bright lights in the workplace, coffee, cold air or energy drinks. Getting enough sleep and listening to our circadian clocks really is that important, so what can a safety professional do to resolve sleep issues? You can’t control workers’ lifestyle and you can hardly force them to get enough sleep, but if you address the seriousness of the problem and show concern for their well-being, they might be willing to make a few changes to improve their sleep habits. It’s helpful to establish and maintain a bedtime routine, so the body learns to relax. Once a person develops specific cues (putting on their pajamas, brushing their teeth, listening to relaxing music, reading a book), their body learns that it’s almost time to sleep and they shouldn’t have problems drifting off. Avoid stimulants (like caffeine, tobacco and alcohol) before bedtime as they can interfere with the body’s natural rhythms. The bedroom should quiet, dark and around 68°F, which is the perfect sleeping temperature for most people. No technology should be allowed in the bedroom. The devices can easily become a distraction, depriving people of valuable sleep. In addition, the blue light from screens also interferes with the body’s production of melatonin, which is produced when the individual is getting ready to rest. Lower levels of this hormone cause difficulty with falling asleep. The brain needs to equate bed with sleep. Watching television or working in bed can negatively influence a person’s ability to relax when it comes to sleeping. That’s because the body is exposed to mixed messages and won’t respond to simply being in bed unless it knows that the pillows and sheets mean sleep. The only way to offset sleep deprivation and fatigue is to get enough hours of sleep. Nobody can cheat it or avoid it. There are many other measures which help manage fatigue when it occurs, but the best thing anyone can do is to follow our internal clock and simply sleep. It will restore a person’s energy, their reasoning abilities, speed up their reaction times and make them less of a hazard on the road or in the workplace. But consistently getting adequate quality sleep is not simple due to the number of contributing factors and the difficulty in building strong sleep-related habits. Bringing the importance of sleep to your workers’ attention is only the first step. You should also build a dialogue about fatigue in the workplace and provide employees with the information and training they need to fight fatigue and its effects. This includes helping them understand how fatigue works and giving them the support and tools they need to address it—including information about sleeping disorders and ways to manage fatigue when it inevitably occurs. It might also help to show your care in their overall well-being by providing them with information on how fatigue negatively affects family life. This could be in the form of talks or statistics on how fatigue makes people less patient with their loved ones, less willing to spend quality time with their children or less likely to give them the attention they need. If you’re interested in more information, tips and advice on how to manage worker fatigue, there’s a free webinar dedicated to exploring the issue and its catastrophic effect on workplace safety and productivity. In addition to providing an overview of the problem, it will offer several useful methods of dealing with the dangers of fatigue in your workplace and preventing serious incidents. Learn more about how you can help employees effectively manage fatigue for a safer and more productive workplace by registering here.